Article first published as Music DVD Review: Taylor Hicks – Whomp at the Warfield on Blogcritics. Whomp at the Warfield captures an electrifying eight-piece band, led by American Idol winner Taylor Hicks, tearing through a set list that included Hicks’ originals as well as covers – sometimes woven together in the same performance. It’s a tour through the varied influences that shaped Hicks’ style, including rock, R&B, funk, and classic soul. Throughout the show, Hicks proves himself a very generous bandleader. Everyone gets a chance to shine, especially the intensely grooving rhythm section of Felix Pollard (drums) and Al Carty (bass). Numerous impressive solos are contributed by saxophonist Brian Gallagher and guitarist Josh Smith. The Taylor Hicks concert experience is a showcase for expert musicianship, with many songs taking off in unexpected directions. Van Morrison’s “Naked In the Jungle” gives way to Sly and the Family Stone’s “Dance To the Music.” Hicks’ own “Heart and Soul” blends with a couple verses from Chuck Berry’s “Brown Eyed Handsome Man.” The band follows Hicks wherever he decides to take them. The harmonica that became Hicks’ calling card early in his career makes several appearances, never outstaying its welcome. He also demonstrates solid rhythm guitar skills. Soaring above it all are the impassioned vocals that earned Hicks his stardom. Pouring energy and conviction into every song, he consistently manages to legitimize the comparisons to more seasoned artists that have been made since he first rose to prominence. The temptation to devolve into fanboyish overstatement is ever-present when appraising an artist who I believe has received undue criticism. Hicks really doesn’t fit into any easily marketable niche. His studio work comes across sometimes as stiff and overly mannered. But onstage he becomes electric; every move he makes is an extension of his musicality. Whomp at the Warfield, especially during its deliriously unhinged highlights, underlines the innate showmanship that has kept Hicks’ career moving forward. On Bryan Adams’ “The Right Place,” a standout track on his self-titled debut album, Hicks seems possessed as he works the band into a frenzy. The other musicians deliver what he demands of them, the smiles (and sweat) on their faces conveying how happy they are to oblige. Finger-picking an acoustic accompaniment to his original ballad “The Fall,” Hicks focuses his intensity while seated on a stool, hardly moving as he commands the audiences’ attention. This is an artist with something to prove. Having toiled for years as an unknown bar room performer, he isn’t about to let his moment pass without packing all that experience into each performance. A substantial half-hour interview with Taylor Hicks turns up as a bonus feature. A variety of topics are explored, justifiably focused on Hicks’ artistic vision. The Warfield show is talked about in detail, as well as the entire 2007 tour. A real treat is the inclusion of a pair of solo acoustic performances. Both songs are early Hicks originals: “Son of a Carpenter” and “In Your Time.” These tunes can be heard on the compilation of independent work Hicks released as Early Works, recorded with the backing of a full band. For anyone who only knows Hicks as a contestant on a televised singing competition, this DVD will likely be an eye-opening experience. 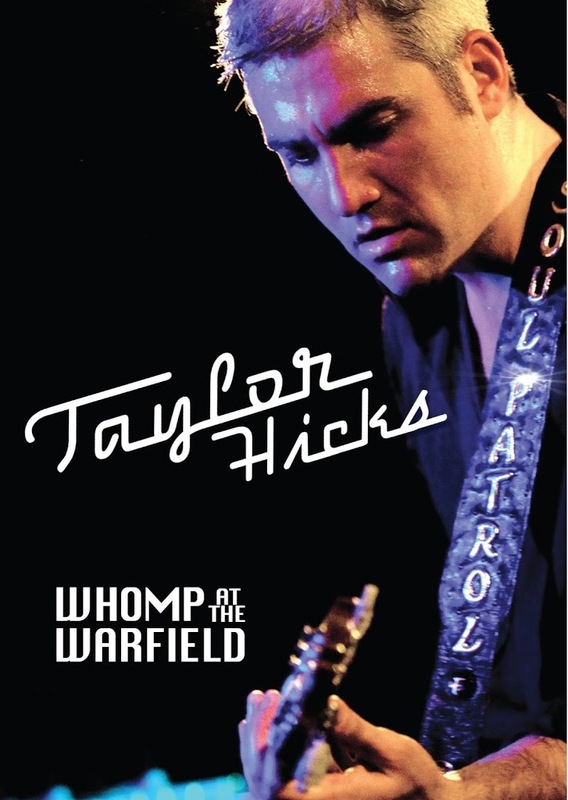 Whomp at the Warfield documents a high point in Taylor Hicks’ career, making for a perfect introduction for those unfamiliar with his work.